Proportional assist ventilation (PAV+) is a partial ventilatory support mode delivering airway pressure (Paw) in proportion to patient effort, enhancing patient-ventilator interactions. The ventilator estimates muscular pressure by using the respiratory system equation of motion with the instantaneous volume (V) and flow (V´) and the automatically calculated compliance and resistance. The mode gains in popularity but the accuracy of the delivered Paw by PAV+ is unknown. To assess the accuracy of PAV+ by comparing the delivered Paw by the ventilator (Pawmeas) to the theoretical Paw as defined by the equation of motion (PawTh) and to examine the factors influencing this accuracy. An active servo lung (ASL5000) was programmed to resemble 4 respiratory mechanics: normal (Compliance (C)=60mL/cmH2O, Resistance (R)=10cmH2O/L/sec), obstructive (C=60, R=20), restrictive (C=30, R=10), and mixed (C=30, R=20). A Puritan-Bennett 840 ventilator with PAV+ was used. PAV+ was tested varying gain (30 and 60%), inspiratory trigger (IT) (0.8, 5 and 15 L/min), muscular pressure (Pmus) (10 and 15 cmH2O), positive end-expiratory pressure (PEEP) (0 and 5 cmH2O), and respiratory rate (RR) (10 to 30/min) to simulate intrinsic PEEP (PEEPi). PEEPi was measured using the Pmus curve. PawTh was calculated as follows: PawTh=[(V/C)+(R×V´)]×Gain + total PEEP. The inspiratory time was defined from the start of Pmus to the end of inspiratory V´. We calculated the difference between the mean Pawmeas and the mean PawTh during inspiration and between Pawmeas and PawTh at 25, 50, 75 and 100% of the inspiratory time. The percentage of difference between Pawmeas and PawTh was calculated as follows: %Δ=(Pawmeas-PawTh)/PawTh × 100. Irrespective of respiratory mechanics and gain, mean Pawmeas was lower than mean PawTh, Table1. This underassistance by the ventilator was greatest at the beginning (25%) of the cycle and decreased later (75%) in inspiration. These findings were replicated under different IT, Pmus or PEEP settings. A high IT led to greater underassistance at the end of inspiration versus a low IT. A high Pmus was associated with a greater underassistance during the entire inspiration versus a low Pmus. A decrease in PEEP was associated with a major underassistance at the start of the inspiration. A higher RR resulted in a higher %Δ, showing that PEEPi increases total trigger delay and affects PAV+ accuracy, fig. 1. Combining the data from all conditions, PEEPi was correlated with the mean %Δ (R2=0.61, p< 0.001). 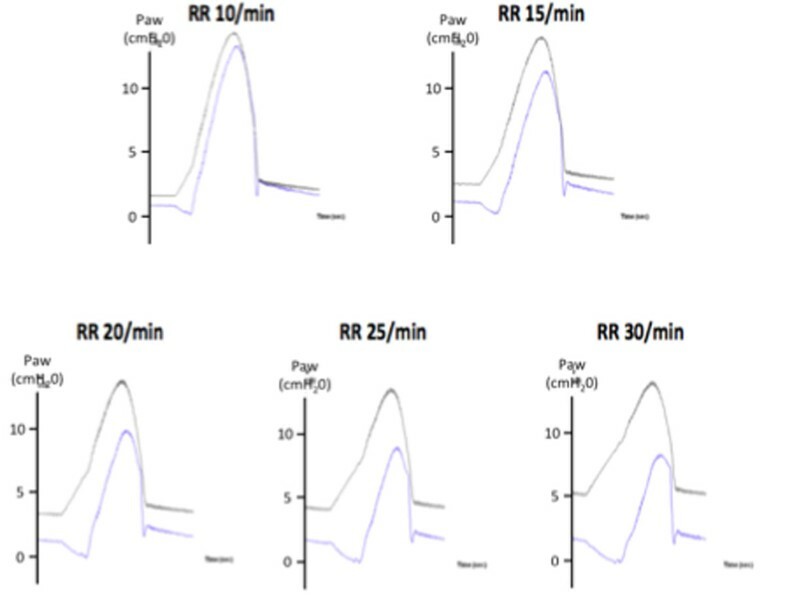 Representative tracings of measured airway pressure (Pawmeas) and theoretical airway pressure (PawTh) with progressive increases in rate (RR) and PEEPi. Black lines: PawTh wareforms. Blue lines: Pawmeas waveforms. Inspiratory trigger = 5 L.min; PEEP = 0 cmH2O; gain = 60%; Pmus = 10 cmH2O; Resistance = 20 cmH2O/L/s and compliance = 60 mL/cmH2O. PAV+ assistance is globally accurate compared to PawTh even if underassistance is often observed, especially at the start of inspiration. PEEPi leading to increased trigger delay is a major factor contributing to PAV+ inaccuracy. Clinical recommandations should include using a high trigger sensitivity and a careful PEEP titration when PEEPi is suspected.